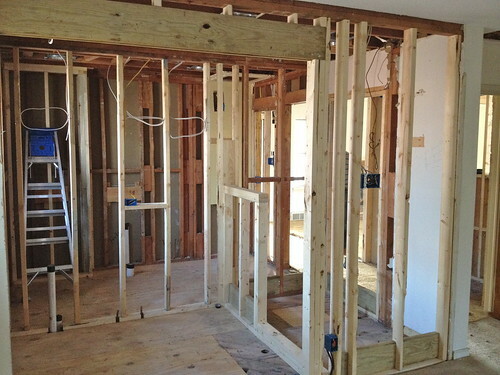 The framing is almost complete over at El Flip. And it looks amazing. The bathrooms totally blew my mind – and moving the furnace was 100% worth it, that extra space makes the master bathroom sing! If we hadn’t moved the furnace to the attic, there’s no way we would have had room for a shower and the master bathroom would have remained just a half bath. Can you envision it? 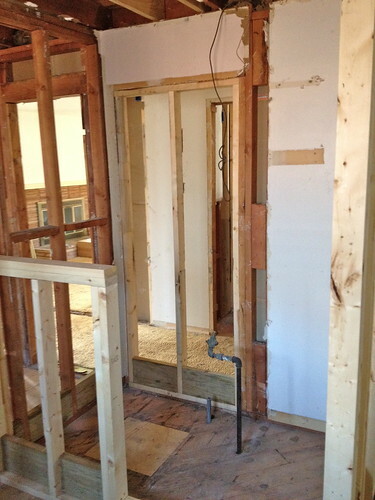 That’s the shower over on the far right-hand wall in the photo below, where the furnace used to be. The double vanity will be along that long wall to the left of the shower, and the toilet will be under the window on the left. 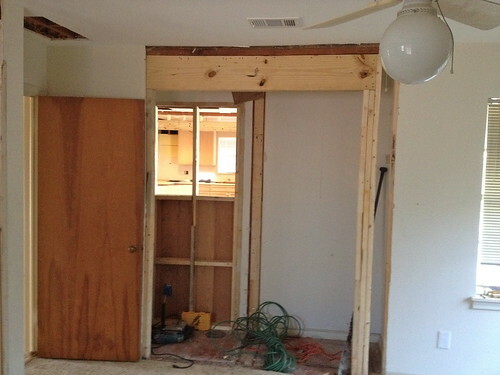 There will be a pocket door leading into the master bedroom for space reasons. And the guest bathroom is looking pretty snazzy, too! The window that you see in the photo above is going to be removed and re-framed as an 18 inch high x 36 inch wide picture window with obscured glass – we couldn’t keep the current window size or location since (1) we reframed that left-hand wall and it now intersects with the window, and (2) that’s where the tub/shower combo is going. 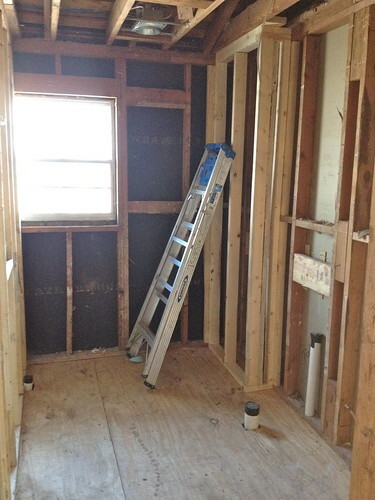 The tub is along the window wall, then the toilet will be where that white pipe is coming out of the floor on the right-hand side, then the single vanity will be between the toilet and the door to the bathroom. Sound good? 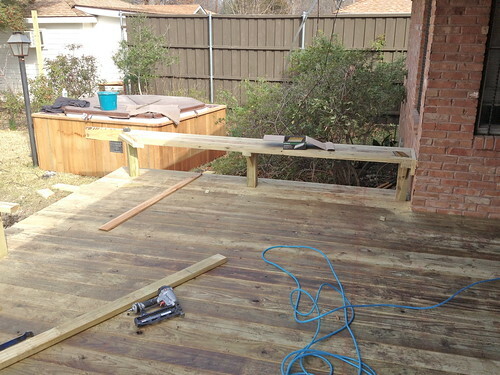 But onto more important things – the DECK!!! I am in love, I am swooning, I hardly know what to do with myself. It’s 16×20 feet of glorious-ness. I bet you can hardly remember that nasty addition that used to be there, right? The concrete foundation for the addition had to come out, and that’s why you see all of that dirt in front of the deck – we’ll fill it in with more dirt and sod. Oh, and here’s a tidbit for ya – see that giant picture window behind my husband, smack dab in the middle of the deck? Well that’s going to become a giant slider, and I’m very excited about having access to the deck from the den. 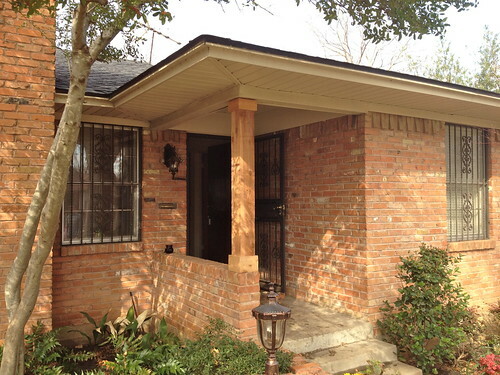 And coming along with that new set of sliders are brand-new windows for the whole house – we just ordered them today! 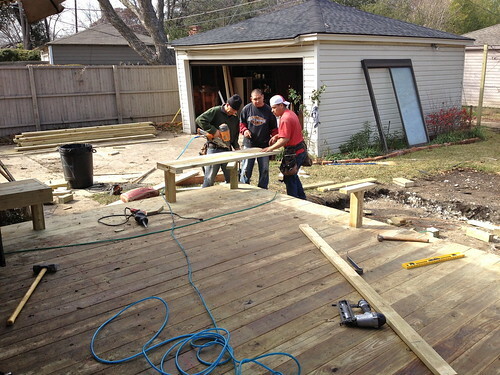 The carpenters are making a bench in the photo above – benches are going to go around almost the entire deck. The only places that will be bench-free are where there will be stairs. We opted to go for benches instead of railings because (1) we have to have something to keep people from falling off the deck, and (2) why would you choose a railing when you could have a bench? That would be crazy. So, in case you couldn’t tell, I’m in love with this deck. I think it’s going to be awesome and that buyers will fall in love with it. Hopefully. Now we’re back inside! Remember how I told you that we were stealing the closet from the den and combining it with the existing master closet to make one giant closet? That’s what’s going on in the photo below. 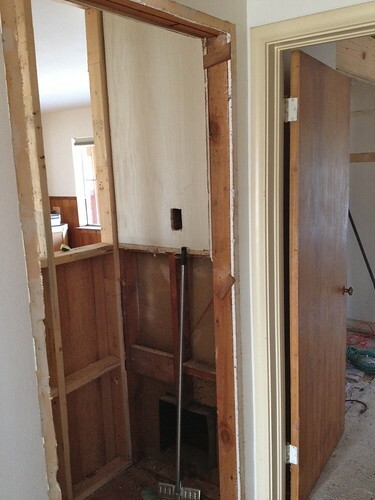 And this photo below shows you where the doorway used to be from the hallway into the den – now it’s been framed in as a coat closet since we sacrificed the existing coat closet to make the guest bathroom’s new layout work. 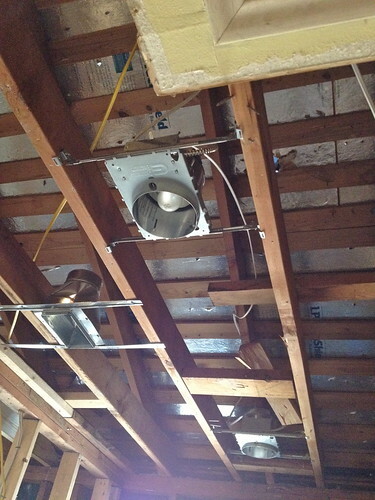 And here’s a glimpse of some of the recessed lighting that just went in! We didn’t go crazy with cans this time – just 2 in each bathroom, 4 in the den and 4 new ones in the kitchen (there were a few existing ones already in there). We also opted to change the flushmount fixtures in the hallway into cans since our new open floor plan means that too many ceiling fixtures could start looking crazy really quickly. 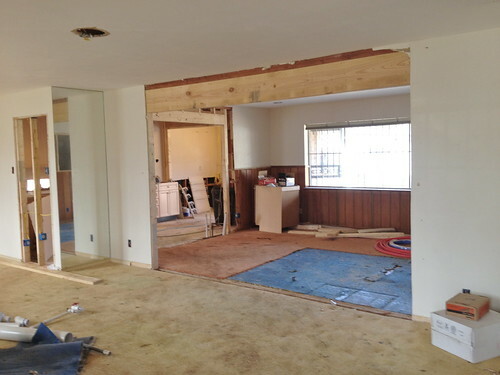 Here’s the view (looking left towards the public areas of the house) from the front door. There’s the dining room straight ahead, the office all the way to the left, the den through the big opening in the dining room (with the window), and then the kitchen on the back left. 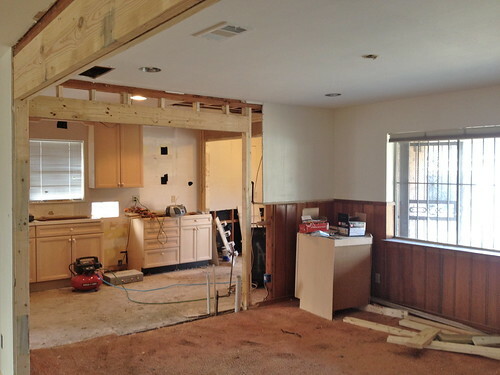 Here’s a better view of the opening between the den and the kitchen. It started out as a standard door between the two spaces, but we opened it up. There will be a peninsula extending from the right-hand side of the opening between the kitchen and the den, dividing the two spaces but still leaving plenty of room to walk on the left-hand side. And finally, we’re back out front! We removed the dated iron scroll post and brackets that were supporting the front porch and went for a cedar post instead. So much better! It will probably be sanded and stained to match the new front door that we’re putting in. What do you think of the changes we’ve made so far? Let me know if you have any questions! wow, you have such a great imagination! i can’t picture any of it (lol) but if it’s anything close to your past flips i’m sure it will be fabulous! i have a question about windows. what do you guys look for when you buy new windows? our current home has unbreakable glass windows that open from the top or bottom, which i love, but had never even heard of before. are there any other great window features that y’all can’t live without? Thanks Bridget! Ah, windows. Those suckers can get expensive quickly! You’re right, there are zillions of awesome options out there – but for us, since we’re just flipping this house, we’re careful not to add (too many) extra bells and whistles that we likely won’t get our money out of (but that, if we were living in the home, we would probably really enjoy). So we just keep it simple and go for an energy efficient window that looks nice – and call it a day! You have been a busy girl! It looks fantastic – I especially love the deck and future slider door access. Can’t wait to see the finished product! That kitchen opening is looking amazing! I love it! I really wish I would have pushed to open up the doorway between the kitchen and dining room, but it would have meant less storage space. But, seeing that opening makes my heart pitter patter. Thanks, Kim! Luckily there wasn’t too much worth saving on that side of the kitchen so we didn’t really lose much when we opened it up – but I totally hear you on opting to keep extra storage space in your own kitchen! Ah, the deck is such an improvement over the addition. Great work so far! Love the deck, and the whole interior looks so incredibly spacious. Very nice work! Question: Not really a fan of the metalwork in front of the windows. What are they for? Ha, have no fear, the metal work is now gone!! For some reason that vintage of house almost always has those bars – maybe the 50s and 60s were dangerous times here in Dallas. :) Either way, they got the boot. Looking good. 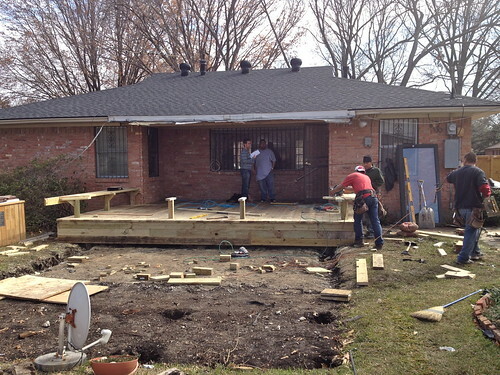 Great ideas to move the furnace, add a slider and put benches on the deck.